I've started NaNoWriMo again. This is my 3rd attempt... of which I have a 50% success rate. Lemme tell you, having to work a night job last year, my prime writing time, I totally and utterly failed! 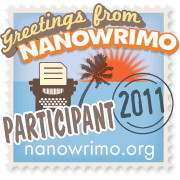 For those of you that don't know, NaNoWriMo takes place in November. It is National Novel Writing Month. In that month, the writers who participate strive to write 50,000 words (the word count that is considered a novel) in those 30 days. The goal is to just write so as not to get caught up in all the second guessing and editing that one can get caught up in when left to one's own devices. You make that push in order to cull something, anything, out of a bunch of words that are spewed onto paper or screen. The thinking is that in the end, you might not have a finished novel, but you'll have the good beginnings of one. As a person who favors the short story format, this hasn't been so successful for me. The first year I tried it and determinedly made the goal, I was left with... mush. Really, I still look at it and think... that's an interesting idea... and maybe I can make a short story out of it... but not much else and definitely not a novel. This is why I think I barely even tried last year. I didn't have much direction other than the way I begin any short story I write: a simple idea that might be a paragraph... or might be a few pages. This year I decided I'd tailor it more to my liking. I'm still pushing for 50,000 words, but I'm aiming for short stories.... 5- 10 at 10,000 to 5,000 words each to be edited after November. The key is to get any idea (10 max) out there and to crank out what could be considered a short story in that time. I like to think of it as making a collection of short stories for me to whittle down and edit. It's working. I've given myself a daily minimum word count and as long as I can do that, I figure that I'm pretty solid. Yesterday was hard to do (maybe because it was my first day?) but today was pretty freakin' easy. I would still be writing right now if this wasn't already such a tough work week and I knew I needed my sleep after having had little of it since last Thursday... or maybe it was Wednesday... anyway, you get the picture. I'm excited... more excited than I have been in a long time. Maybe it's because I've finally gotten how to do this on my terms, and maybe it's because I'm just doing it. If there is a human being that can do this to their own satisfaction, it you kid. Go get the'm. P.S. I'm back from the grave swinging, and running in the direction of an office, which I don't know. It's going to get weird.